Luxurious two bedroom apartment for sale in Abraj Al Lulu at Seef district. This apartment has a nice view of Seef, Bahrain City Centre and the sea. 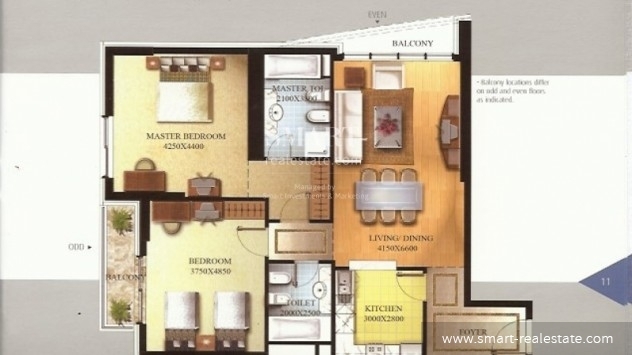 It comes semi furnished with kitchen appliances, flooring and painted walls. This apartment for sale is perfect for those families, amenities include controlled air conditioning, car parking, children's play area, common swimming pool, jacuzzi, sauna and steam baths, tennis court, satellite and internet connection provision, elevator and a well equipped fitness gym. For more details about this elegant and luxurious apartment for sale in Abraj Al Lulu, Seef, contact Smart Real Estate today. Smart Real Estate offers a vast listing of villas, apartments, commercial spaces, and lands in Seef for sale. Make your dream property a reality with us at Smart Real Estate. Visiting schedules are available upon request.